Seger, W., Ghalyanchi Langeroudi, A., Karimi, V., Madadgar, O., Vasfi Marandi, M., Hashemzadeh, M. (2016). Prevalence of avian infectious bronchitis virus in broiler chicken farms in south of Iraq, 2014 – 2015. Veterinary Research Forum, 7(4), 317-321. Waleed Seger; Arash Ghalyanchi Langeroudi; Vahid Karimi; Omid Madadgar; Mehdi Vasfi Marandi; Masoud Hashemzadeh. "Prevalence of avian infectious bronchitis virus in broiler chicken farms in south of Iraq, 2014 – 2015". Veterinary Research Forum, 7, 4, 2016, 317-321. Seger, W., Ghalyanchi Langeroudi, A., Karimi, V., Madadgar, O., Vasfi Marandi, M., Hashemzadeh, M. (2016). 'Prevalence of avian infectious bronchitis virus in broiler chicken farms in south of Iraq, 2014 – 2015', Veterinary Research Forum, 7(4), pp. 317-321. Seger, W., Ghalyanchi Langeroudi, A., Karimi, V., Madadgar, O., Vasfi Marandi, M., Hashemzadeh, M. Prevalence of avian infectious bronchitis virus in broiler chicken farms in south of Iraq, 2014 – 2015. 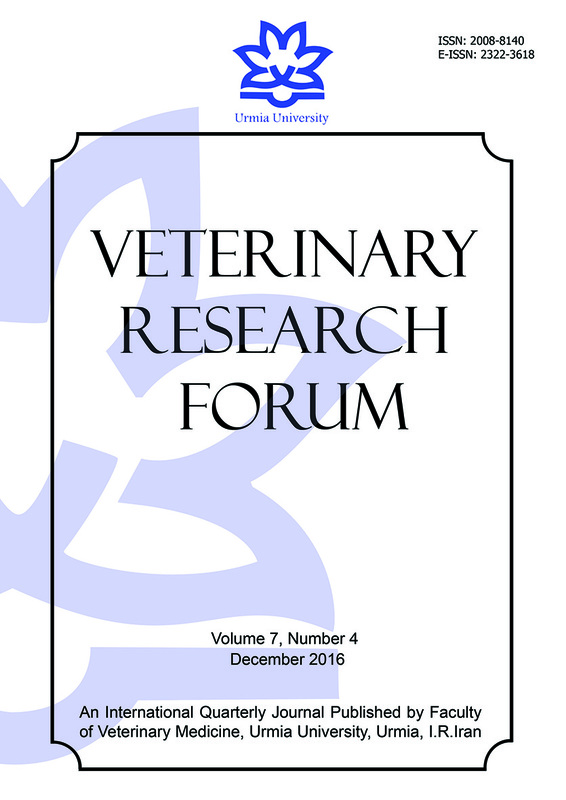 Veterinary Research Forum, 2016; 7(4): 317-321. Avian infectious bronchitis (IB), caused by a gammacoronavirus, is an OIE-listed (List B) disease and characterized by respiratory and renal involvements, causing high mortality, and economic loss in both layers and broilers. In comparison with other diagnostic methods, real-time polymerase chain reaction (RT-PCR) and conventional RT-PCR are potent, more sensitive and faster techniques for infectious bronchitis virus (IBV) detection. This research was conducted to detect IBV using specific primers of IB in three governorates (Basra, Thi-Qar and Muthana) in the south of Iraq. Tracheal specimens were collected from 46 IB suspected commercial broiler flocks. XCE2+ and XCE2- Primers, which amplify all IBV serotypes, were used. Primers MCE1+, BCE1+ and DCE1+ were used to amplify the specific nucleotide sequences of Massachusetts, 793/B and D274 genotypes, respectively. The results of real-time RT-PCR of this study showed that 34 (74.00%) out of 46 infected flocks were positive to IBV. The results of nested PCR showed that 50.00% and 5.89% of positive samples were belonged to genotypes 793/B and Massachusetts, respectively, and the remaining positive (44.11%) were unknown. 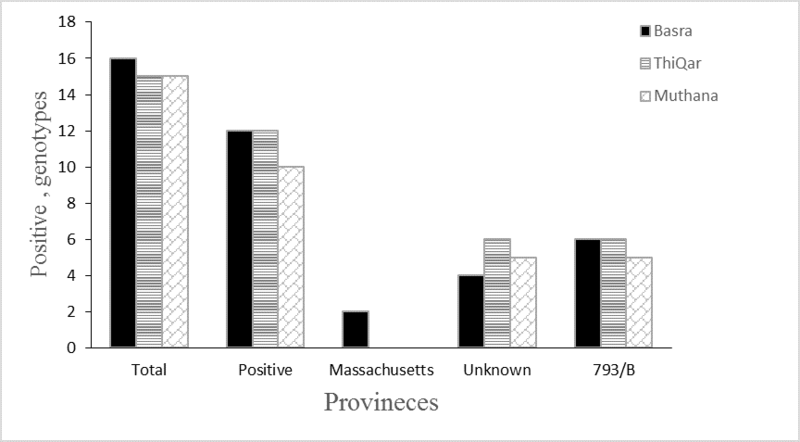 The results indicate presence of Massachusetts and 793/B IBV strains in commercial broilers in southern Iraq. The D274 type was the most common type of IBV in several western European countries in the early and mid-1980s.5 IBV strains of the 4/91 type, which are also known as 793B, were first reported and characterized in Britain, 1991,6 and have been the dominant genotype in Europe.7 The Serological survey has revealed a high incidence of IBV infection of the 793/B type in layer and broiler chickens worldwide.8 Infectious bronchitis still causes serious problems in the Iraqi poultry industry due to the inability of the vaccines to protect the different genotypes. Due to the limited network of poultry diagnostic laboratories in Iraq, differential diagnosis is only made according to clinical signs and gross lesions. The characterization of IBV has raised additional problems in terms of both epidemiology and control. Although IBV in the poultry farms in Iraq (with H120 and 4/91 strains) is presently controlled by both inactivated and live attenuated vaccines, the outbreaks of IB have still been observed on broiler farms.9,10 In Iraq, the first report of identification and genotyping of IBV isolates has been from Kurdistan-Iraq, which indicated the circulation of 793/B ( with the prevalence rate of 25 %) along with a new IBV variant (Sul/01/09) in vaccinated (Ma5 , or 4/91) broiler farms.10 So far, there has been no report on the prevalence rate of IBV genotypes in the south of Iraq. The aim of the present study was to detect of three IBV genotypes including (Massachusetts; Mass), 793/B and D274 in the south of Iraq. Sampling. Tracheal tissue samples were collected from 46 IB suspected broiler farms, located in Basra, Thi-Qar and Muthana governorates. All chicks were 20-35 day-old and vaccinated with H120 and 4/91. Five tracheal tissue samples per flock were selected for RNA extraction. RNA extraction and cDNA synthesis. Total RNA was extracted from the tracheas using CinnaPure RNA (Sinaclon Co., Tehran, Iran) based on the kit instructions. The extracted RNA was used in reverse transcription (RT) reaction to generate cDNA through cDNA synthesis kit (Thermo scientific, Waltham, USA). The cDNA was stored at –20 ˚C until use. Real-time PCR for IBV detection. Real-time PCR was carried out to detect IBV. TaqMan® probe and primers (Bioneer Corporation, Daejeon, Korea) were used in this study according to Callison et al. method.11 Forward primer 5’ GCTTTTGAGCCTAGCGTT3’, reverse primer 5’ GCCATGTTGTCACTGTCTATTG 3’, and TaqMan® dual-labeled probe FAM-CACCACCAGAACCTGTCACCTC-BHQ1, were used to amplify and detect a 143-bp fragment of the 5’-untranslated region (5’UTR). The mixture for each tube was consisted of 13 μL TaqMan Master Mix, 0.2 μL of 2 pM IBV probe, 1 μL of 10 pM forward primer, 1 μL of 10 pM reverse primer, 2.8 μL distilled water, to reach a total volume of 18 μL. Then, 2 μL cDNA was added. A negative control containing nuclease-free water instead of cDNA were included in each run. The thermal profile for the PCR was 95 ˚C for 10 min, followed by 40 cycles of 94 ˚C for 15 sec, 50 ˚C for 30 sec and 72 ˚C for 30 sec. PCR amplification was performed using Rotor Q (Qiagen Co., Hilden, Germany) system. Nested PCR for IBV genotyping. For determination of genotypes, a type specific nested PCR was conducted.12 Oligonucleotide primers included MCE1+, DCE1+, and BCE1+ which specifically amplified a hyper-variable region of the S1 gene of Mass, D274 and 793/B serotypes, respectively. XCE3- primer was a common primer for all IBV genotypes detection. Primer sequences and their expected band size are shown inTable 1. The first round amplification was performed in a final volume of 20 µL (2 μL distilled water, 13 μL 2X PCR master mix (Sinaclon Co.), 1 μL forward primer (XCE2+) primers, 1 μL reverse primer (XCE2-) and 3 μL cDNA. Amplification was performed with a thermal profile of (94 ˚Cfor 5 min, 94 ˚Cfor 45 sec, 58 ˚C for 45 sec, 72 ˚C for 90 sec, and 72 ˚C for 5 min) for 40 cycles. Two microliter of the first round PCR product was diluted with 198 μL of distilled water, whereas in the second round nested PCR we used (2 μL distilled water, 13 μL 2X PCR master mix (Sinaclon Co.), 1 μL forward Primer (XCE3-), 1 μL reverse primer (DCE1+) and or MCE1+, BCE1 + and 3 μL RT-PCR Product) amplification was 94 ˚Cfor 2 min, 94 ˚Cfor 15 sec, 48 ˚Cfor 30 sec, 68 ˚Cfor 30 sec, and 68 ˚Cfor 10 min) for 40 cycles. 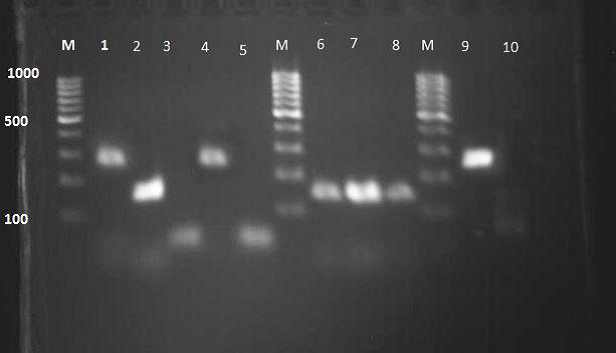 The polymerase chain reaction (PCR) product was analyzed by electrophoresis on 1% agarose gel. In the current research, 46 broiler flocks were selected for tracheal tissue sample collection. The results of real-time RT-PCR of this study showed that 34 (74.00 %) out of 46 infected flocks were positive to IBV (Fig. 1). 35.00% of positive samples were from Basra, 35.00% of them were from Thi-Qar and 30.00% from Muthana governorates. Amplification of an expected DNA band of 295 bp, and 154bp from positive control, as well as, positive samples indicated that the nested PCR reaction has been performed correctly (Fig. 2). The results of nested PCR revealed that (50.00%), (5.89%), and (44.11%) of these flocks have 793/B, Mass, and unknown strains, subsequently (as shown in Fig. 1). 793/B had the equal prevalence rate in each governorate, but Mass serotype was just detected in Basra governorate. The present study indicated a relatively high prevalence of 793/B IBV genotype in the south of Iraq. D274 genotype was not detected. Fig. 1. Distribution of positive IBV samples including 793/B, Massachusetts and unknown strains in the broiler farms of three governorates in the south of Iraq. Fig. 2. Electrophoresis (2% agarose gel) for infectious bronchitis virus (IBV). Lane M: 100 bp – 1000 kbp DNA ladder marker; Lane 1: Massachusetts (positive control; band at 295 bp); Lane 2: Positive control (793/B; band at 154 bp); Lanes 3: Negative control; Lane 6, 7, 8: 793/B (positive samples); Lanes 4 and 9: Massachusetts (positive samples); Lanes 5 and 10: Negative samples. The results of the present study showed that 34 (74.00%) out of 46 sampled flocks were positive to IBV by real-time PCR and that 35.00%, 35.00% and 30.00% of the sampled flock in Basra, Thi-Qar and Muthana, respectively, governorates were positive to IBV. In addition, the results showed the distribution of 793/B and Mass genotypes with the prevalence rate of 50.00% and 5.89%, respectively, yet no D274-type virus was detected in the south of Iraq. The presence of other IBV types is probable, however, they were not detectable as applied primers were specifically amplified three types of IBV. Unknown positive IBV strains must be sequenced to be characterized. In Israel, Mass was the only type detected for many years until the 793B type of IBV (Israel/793B/variant 1/96) was identified in 1996.21 Detection of 793/B serotype has been reported from Saudi Arabia, Japan, Denmark, Poland, France, Italy, and Argentine.22 Also, the 793B type was reported in Iran; the co-existence of Mass and 793/B type’s viruses at the same time in 33 flocks in Iran revealed that Mass type vaccine viruses have not conferred a proper immunity against 793/B type viruses.23 There was a study in the middle of Iraq, showed that 92.10% of samples collected from suspected flocks were infected with IBV, 20.00% of samples were infected with IB alone and 45.71% of samples with IB combined with both Mycoplasma galisepticum and avian influenza virus subtype H9 and 25.71% of samples were positive to both IBV and AIV(H9).9 Mahmood et al. isolated infectious bronchitis virus from trachea and kidney tissues of eight broiler farms in Kurdistan region of North Iraq from 2008 to 2010. Their results showed that two farms were just infected with 793/B type, one with an unknown strain and five with Sul/ 01/09.10 Jahantigh et al. conducted a work to identify the infectious bronchitis virus with group-specific primers in Zabol, south-east of Iran. Their results showed that 36.36% of the sampled flocks were positive to IBV by RT-PCR.24 Also, in Jordan, there are studies that have detected the presence of IBV, like Ark, DE-072, and Mass-like serotypes.25 Another study of Jordan showed that sampled flocks have Mass, 4/91, and D274 isolates, respectively.26 However, D274 genotype was not detected in the present study. Our results showed the low prevalence (5.89%) of Mass type in Basra that was in consistent with Mahmood et al. results who found no Mass-type IBV in the North of Iraq.10 In our research, 50.00% of farms in each governorate were infected with type 4/91, which was two times higher than its prevalence in Kurdistan region of Iraq. According to 4/91 based vaccination strategies applied in Iraq, 4/91-type IBVs could be vaccine-derived, however, this high prevalence rate also may reflect the weak biosecurity systems and uncontrolled entering of broiler chicks from other Iraqi governorates or intense trading with neighboring countries (Turkey, Iran, Jordan, and Saudi Arabia). The large number of IBV variants exist worldwide, some being unique to a particular area and others having a more general distribution. The reason why some strains spread readily over major parts of the world whereas others remain local is unknown. Some IBV variants, such as 793/B or QX that have been spread over Asia, Europe, and Africa in a short period, have not been reported in the USA or Australia. It seems likely that geographical isolation and control measures employed in countries may play a significant role in preventing entry of IBV variants. The recent discoveries of IBV and IBV-like strains in other species of birds other than the chicken,27 like geese, ducks, and pigeons, might also play roles in the spread of IBV strains over the world. Specific IBV strains that were able to infect another bird species, especially if it is a migratory bird, would spread more easily over long distances than a strain that could not replicate in that bird species. In conclusion, the current study clearly demonstrated that there was the presence of 793/B and Mass IBV genotypes (Vaccine or field strain) in commercial chicken flocks in south of Iraq. By utilizing diagnostic techniques such as those were used in this study, it is possible to conduct a detailed epidemiological investigation of this disease. Despite the use of H120 and 4/91 vaccines in Iraq, it is common to find IB problems in vaccinated chickens. In the present study, the sequencing of PCR products was not performed, therefore, the origin of these types is not clear at present. Future work should include the sequencing of IBV strains in the region in order to determine the type of unknown strains and to choose the suitable vaccination program. This study was financially supported by the Ministry of Higher Education and Scientific Research, Iraq, University of Basra (No.7.30.4603) and by Research Council of the University of Tehran under the grant (No.28692-6-2). The authors gratefully acknowledge Dr. Hamideh Najafi, Dr. Taha Zabihi and Dr. Iraj Ashrafi for their extensive technical supports. Sun C, Han Z, Ma H, et al. Phylogenetic analysis of infectious bronchitis coronaviruses newly isolated in China, and pathogenicity and evaluation of protection induced by Massachusetts serotype H120 vaccine against QX-like strains. Avian Pathol 2011; 40(1): 43-54. Cavanagh D. Nidovirales: A new order comprising Coronaviridae and Arteriviridae. Arch virol 1996; 142(3): 629-633. Bochkov YA, Batchenko GV, Shcherbakova LO, et al. Molecular epizootiology of avian infectious bronchitis in Russia. Avian Pathol 2006; 35(5): 379-393. Momayez R, Pourbakhsh SA, Khodashenas M, et al. Isolation and identification of infectious bronchitis virus from commercial chickens. Arch Razi Ins 2002; 53: 1-10. Cavanagh D, Mawditt K, Britton P, et al. Longitudinal field studies of infectious bronchitis virus and avian pneumovirus in broilers using type-specific polymerase chain reactions. Avian Pathol 1999;28(6): 593-605. Adzhar A, Gough RE, Haydon D, et al. Molecular analysis of the 793/B serotype of infectious bronchitis virus in Great Britain. Avian Pathol 1997; 26(3): 625-640. Worthington KJ, Currie RJ, Jones RC. A reverse transcriptase-polymerase chain reaction survey of infectious bronchitis virus genotypes in Western Europe from 2002 to 2006. Avian Pathol 2008; 37(3): 247-257. Cook JK, Orbell SJ, Woods MA, et al. A survey of the presence of a new infectious bronchitis virus designated 4/91 (793B). Vet Record 1996; 138(8): 178-180. Al-Dabhawe AH, Kadhim HM, Samaka HM. Molecular detection of infectious bronchitis virus and it is relation with avian influenza virus (H9) and Mycoplasma gallisepticum from different geographical regions in Iraq. Iraq J Vet Sci 2013; 27(2): 97-101. Mahmood ZH, Sleman RR, Uthman AU. Isolation and molecular characterization of Sul/01/09 avian infectious bronchitis virus, indicates the emergence of a new genotype in the Middle East. Vet Microbiol 2011;150(1): 21-27. Callison SA, Hilt DA, Boynton TO, et al. Development and evaluation of a real-time Taqman RT-PCR assay for the detection of infectious bronchitis virus from infected chickens. J Virol Methods 2006; 138(1): 60-65. Adzhar A, Shaw K, Britton P, Cavanagh D. Universal oligonucleotides for the detection of infectious bronchitis virus by the polymerase chain reaction. Avian Pathology. 1996;25(4):817-836. Mckinely ET. Molecular diversity, evolutionary trends, and mutation rates in avian corona virus infectious bronchitis virus. Phd Thesis. Faculty of The University of Georgia .Georgia, USA: 2009. Cavanagh D, Picault JP, Gough RE, et al. Variation in the spike protein of the 793/B type of infectious bronchitis virus, in the field and during alternate passage in chickens and embryonated eggs. Avian Pathol 2005; 34(1): 20-25. Dolz R, Pujols J, Ordónez G, et al. Molecular epidemiology and evolution of avian infectious bronchitis virus in Spain over a fourteen-year period. J Virol 2008; 374(1): 50-59. Farsang A, Ros C, Renström LH, et al. Molecular epizootiology of infectious bronchitis virus in Sweden indicating the involvement of a vaccine strain. Avian Pathol 2002; 31(3): 229-236. Hopkins SR, Yoder HW Jr. Reversion to virulence of chicken-passaged infectious bronchitis vaccine virus. Avian Dis 1986; 30(1): 221-223. Bochkov YA, Tosi G, Massi P, et al. Phylogenetic analysis of partial S1 and N gene sequences of infectious bronchitis virus isolates from Italy revealed genetic diversity and recombination. Virus Genes 2007; 35(1): 65-71. Armesto M, Evans S, Cavanagh D, et al. A Recombinant Avian Infectious Bronchitis Virus Expressing a Heterologous Spike Gene Belonging to the 4/91 Serotype. PLoS ONE 2011; 6(8): e24352. Benyeda Z, Szeredi L, Mató T et al. Comparative histopathology and immunohistochemistry of QX-like, Massachusetts and 793/B serotypes of infectious bronchitis virus infection in chickens. J Comp Pathol 2010; 143(4): 276-283. Nouri A, Assasi K, Seyfi-abad Shapouri MR. Field study of infectious bronchitis virus in broiler using type-specific RT-PCR. Arch Razi Ins 2003; 55: 1-10. Shoushtari AH, Toroghi R, Momayez R, et al. 793/B type, the predominant circulating type of avian infectious bronchitis viruses 1999-2004 in Iran: A retrospective study. Arch Razi Ins 2008; 63(1): 1-5. Jahantigh M, Salari S, Hedayati M. Detection of infectious bronchitis virus serotypes by reverse transcription polymerase chain reaction in broiler chickens. Springer Plus 2013; 2(1): 36. Gharaibeh SM. Infectious bronchitis virus serotypes in poultry flocks in Jordan. Prev Vet Med 2007; 78(3): 317-324. Roussan DA, Totanji WS, Khawaldeh GY. Molecular subtype of infectious bronchitis virus in broiler flocks in Jordan. Poult Sci 2008; 87(4): 661-664. Cavanagh D. Coronaviruses in poultry and other birds. Avian Pathol 2005; 34(6): 439-448.